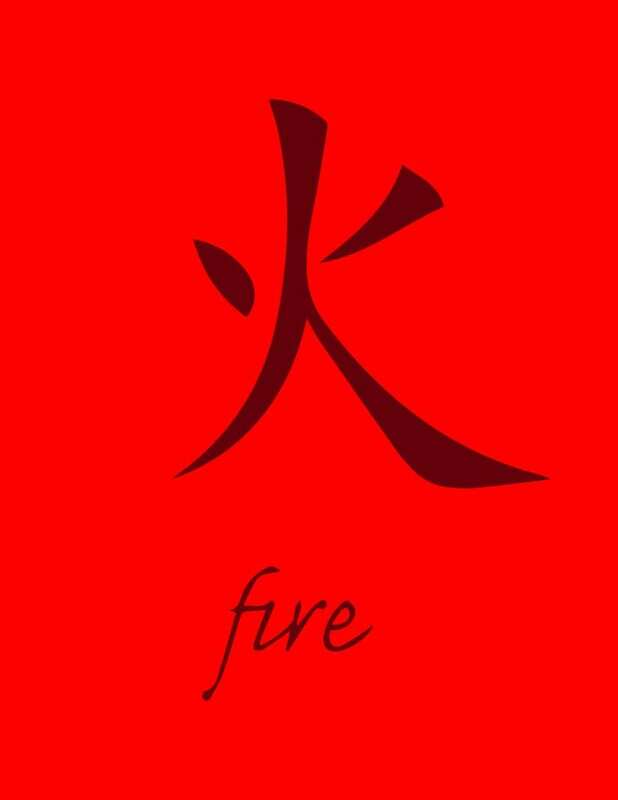 The Fire Element represents our ability to evolve through relationship, to grow our humanity, to feel safe, to feel in control, to be intimate, to have fun, to laugh and to be excited. If the Heart (Yin) is unstable there is a feeling of anxiety and panic - the kingdom is out of control. When the heart goes cold, the world is a gloomy and chilly place. Through honest, responsible, compassionate connections to others we can mature beyond superficial or conditional sentiment and strive to develop courtesy, integrity and cultivate our character. These characteristics are the roots and tree that bear the fruit of wisdom and daily actions that reflect our progress and grow our soul. The Small Intestine Meridian (Yang) is known as the "Sorter of Pure From Impure". It is the energy that helps us discern what is needed and what is rubbish in a mental, emotional and physical sense. Fire is also the energy of the Heart Protector or Pericardium Meridian (Yin) and The Triple Burner (Yang). The Pericardium manages our ability to have connection to people, the energy that stands in front of our heart and shields us from hurt, like a warrior would protect a monarch. The Triple Burner Meridian looks after the three burning spaces - the top, middle and bottom of our bodies trunk area. It is our internal thermostat that looks after our emotional and physical temperature. Considered the Emperor of all organs in Oriental Medicine, the heart is responsible for regulating circulation and supplying blood. However, it is also affected by our emotions and state of mind. Imbalances along these pathways can cause anxiety, sleep disturbances, and poor complexion. Improved circulation though the Heart Meridian, can also help those diagnosed with heart disease, high blood pressure or elevated cholesterol levels. Other benefits include improved emotional health and reduced stress levels. 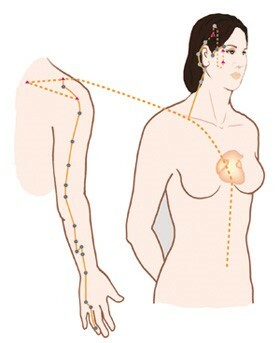 The Heart Meridian is characterized by hot energy. It holds energy that’s hot, like summer. Activating this meridian is a good healing method for those whose body’s are cold, and activating this meridian in the cold winter would be also be effective. The Heart Meridian contains the sensibility of love. When you fall in love, your Heart Meridian is activated. Look at people whose Heart Meridian is activated, and you will see they have an strong artistic sensibility. So the Heart Meridian’s energy has the sentimentality of love, the passion of hot energy and an artistic sensibility. Ultimately developing the Heart Meridian and Chakra is to grow to infinite love. The more you cultivate infinite love, the more peaceful your heart becomes. The more you fill your heart with joy, the more peace comes to you. When your love grows broader in this way, it becomes a little more stable, more noble, and a greater joy develops in your heart. When that love grows even greater, and develops into a love for humanity - it changes into deep peace. Our ideal love of that between a couple, gradually grows in this way. Developing into a love for family, for community, for for humanity. When it goes further, deepening into a love for nature, for the cosmos. It changes into the mind of heaven, into the love of heaven. Then as we welcome infinite peace, deep within, we discover the nature of original life. This development of small love, into great love we feel as the growth of our souls. Great love, the love of heaven, although invisible brings us deep peace and gratitude, and within that we can encounter infinite life. There are a number of exercises that can protect your heart and help it function at its prime condition. Some accentuating tips include: Pumping your elbows during a brisk walk (see: "Energy Walking") or otherwise opening your chest through using your arms which effectively enhances cardiovascular exercise. Conversely, a half-lotus forward bend while exhaling through your mouth relieves tightness in the chest and allows you to breathe deep at full capacity. Additionally, whole body relaxation, which involves lying on the floor and taking part in various mental exercises in order to relieve tension, enhances blood circulation and contributes to the relief of hypertension, insomnia and other autonomic nervous system disorders. Fire Energy connects the heart with the Small Intestine through the energy principal, “Water Up Fire Down” which manages healthy stress response and is a crucial sta­dard for maintaining balanced health. The Small Intestine lies un­der the stomach in coils of up to 20 feet and is encircled by the large intestine. This is where pure and impure proper­ties are separated; the nutrient energy is sent to the spleen, the liquid waste is sent to the urinary bladder, and the solids are sent to the large intestine. While the heart holds the space of potentiality of the awakening lotus, the small intestine is the mud from which it grows, contro­lling the most basic emotions. When the intestines becomes stiff and hard due to bad circulation of energy and blood, the whites of the eye turns yellowish and imbalance mani­fests in myriad forms. Ear infections and hearing impairment, constipation or diarrhea, sore throats, head­ache, sinusitis, irregular menses, lower back pain, painful testes, urinary difficulties and stiff neck are common symptoms. The preventative key is to keep the intestines warm. Sustaining warmth naturally thwarts stiffening and hardness. Also, when the intestines are warm the small intestine is able to absorb more nutrients from food. In the Tao Healing Arts we have a saying: "Drink your food and eat your drink" Good digestion begins with thoroughly chewing everything you eat... and even drink. Chewing builds saliva which carries enzymes to be released by the HCI in your stomach which in turn sterilizes harmful bacteria and helps digest protein. Peristalsis is another important function that would normally be part of our involuntary physical digestive function, but needs more conscious attention in our modern lifestyle, especially if you suffer from low energy. fatigue, constipation or diarrhea. The Intestines should be toned - neither too stiff nor too soft. expanding and contracting like a snake to process food. Peristalsis keeps the small-intestine healthy and free of plaque to best draw nutrients through little blood vessels that run along the lining. Popular in the East, the best exercise to restore peristalsis and warm your intestines is "Intestine Exercise". Remain standing, or lie down on your back. Place your hands on your abdomen and push your abdomen out until you feel pressure. Slowly and deeply pull your abdomen back in an effort to touch the spine. Repeat this movement 100 times in a rhythmic movement and you can grad­ually increase the number of repetitions to 500 or more. To release stiffness and create warmth, it is important to practice on a daily basis. 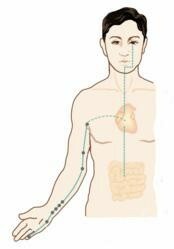 Also helpful is "Belly Drumming" and applying acupressure along the points of the small intestine meridian. By fortifying our immune system through the small intestine and listening to our heart, we recognize we are part of an eco-system. An eco-system that consciously places Mother Earth as the one common value that can and should over-ride our individual or collective differences. When we are in touch with our true nature through the Fire Element we cultivate the wisdom to flow with the energy, vitality and growth that enriches the evolutionary life cycle of our environment. This is where the journey of meaningful purpose and strengthening character begins and with the right guidance, the 5 Elements is a reliable path to follow and reflective barometer to gage from. I have never seen the heart represented as yang nor tw and si as yin.. you explain it very well in the article, just curious as to to the origin of your teachings. Again, thank you..
Wow! This is such valuable information. Thank you.